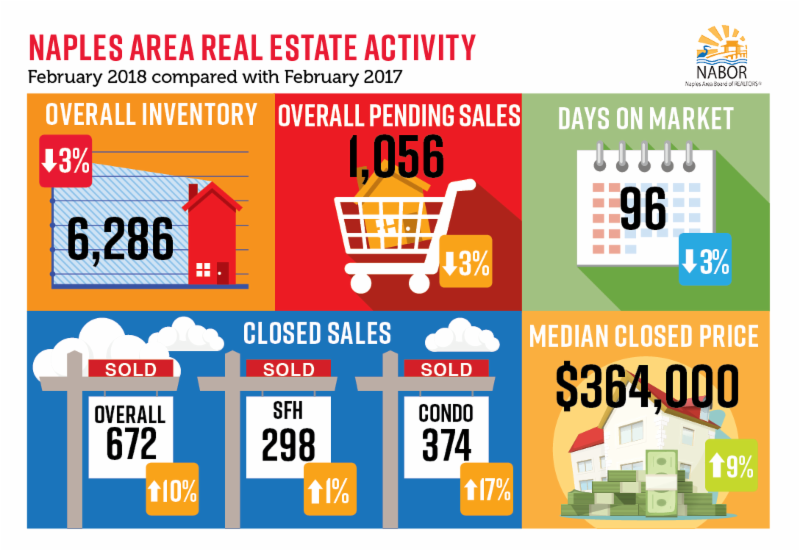 Naples, Fla. (March 16, 2018) – Buyer interest in homes over $1 million in Naples continued to climb during February as overall closed sales increased 10 percent to 672 homes sold compared to 613 homes sold in February 2017, according to the February 2018 Market Report released by the Naples Area Board of REALTORS® (NABOR®), which tracks home listings and sales within Collier County (excluding Marco Island). The February Market Report revealed a 9 percent increase in the overall median closed price to $364,000 in February 2018 from $333,000 in February 2017. However, as identified by Bill Coffey, Broker Manager of Amerivest Realty Naples, this was due in part to a 95 percent increase in closed sales for properties priced over $1 million in February. In fact, the median closed price within each of the five price categories tracked by NABOR® actually decreased. The greatest decrease appeared in the $1 million to $2 million price category, which reflected a 12 percent drop to $1,326,000 from $1,500,000 in February 2017. Inventory continued to rise for the fifth straight month, but it decreased in February by 3 percent to 6,286 properties compared to 6,466 properties in February 2017. “The new tax laws appear to be inspiring confidence in wealthy buyers,” said Kathy Zorn, broker/owner, Better Homes and Gardens Real Estate Pristine, who also pointed out that the February Market Report showed 44 of the 52 homes purchased in the $2 million price category were cash purchases. The February report showed a 6 percent increase in inventory for condominiums in the $300,000 and below market. This was the highest increase reported among all price categories and home types. Interestingly, this segment’s median closed price dropped 2 percent in February (month over month) to $200,000 from $205,000 in February 2017. Geographically, sales activity in the Naples Beach single-family homes market outpaced all other areas. Increased buyer interest in luxury properties located in this highly valued location resulted in a 33 percent uptick in closed sales, yet the heightened attention also influenced median closed prices, which rose 52 percent in February to $1,350,000 from $860,000 in February 2017. Coincidentally, similar to an unusual closed sales anomaly in January that was reported last month, a high number of delayed closed sales in one luxury condominium located in North Naples influenced February’s closed sales, median closed price, and days on market statistics for the month. As reflected in the report, there were 56 closed sales of condominiums above $1 million in the North Naples area in February (a 211 percent increase over February 2017). A great majority of them were identified as having zero days on market, which broker analysts contend were from one particular condominium’s sales activity. If you are looking to sell a home in Naples, contact The Wakelin Realty Team because we have the experience and knowledge to provide an accurate market comparison so you can determine the right asking price. We can also ensure your next purchase in the Naples area is a success.